Editor’s Note: The founder of her own agribusiness consultancy Cardy-Brown, Emma Cowan has worked in the industry for more than 25 years holding senior positions at Rabobank, Syngenta and Seminis (Monsanto). She can be reached on [email protected]. We are in the midst of a race among the world’s biggest agribusinesses to consolidate. 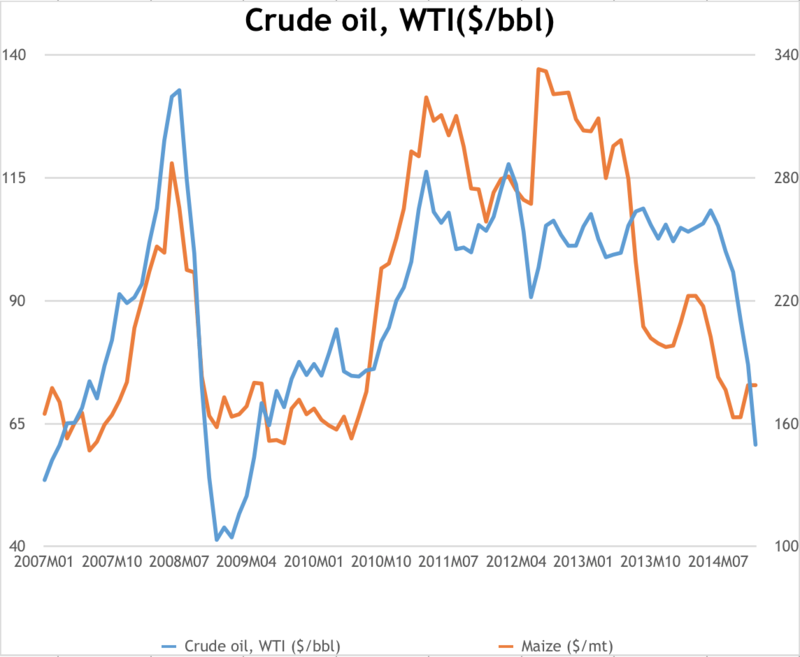 Sparked by falling commodity prices — dragged down by a combination of high stocks and falling oil prices (see graph below) — farm incomes are also falling weakening farmers’ buying power. Farm machinery companies have been reporting falling sales as farmers tighten their belts and minimise expenditures. For farm inputs, fertilizers, crop protection chemicals and seeds, the market is also likely to crimp. There will be little expansion in the number of acres under production in the major agricultural countries outside of Africa. This all means that the market in which a number of major agribusiness players are active is not going to grow in size until the current cycle returns to growth. In an effort to ‘batten down the hatches’, the large players in the crop protection and seeds industry are looking for economies of scale and production efficiencies. One way to achieve this is to consolidate and reach for synergies. So the race to consolidate was kicked off by Monsanto’s first takeover offer for Syngenta earlier this year; a takeover bid which ended in failure in August after Syngenta rejected Monsanto’s Sfr44 billion ($44.6 billion) offer. The urgency within the industry to merge or acquire has since then been palpable with discussions ongoing between apparently all of the major players (See bubble chart). The first to announce a successfully negotiated tie up are Dow Chemical and Dupont, two of the US’s oldest companies, who seem to have been manipulated into arranging a deal quickly due to excessive investor pressure. Dow and Dupont announced their ‘merger of equals’ on December 11, 2015, resulting in a 5.5 percent fall in Dow’s share price. Initially a merger of equals creating ‘DowDuPont’, the company will later be split into three separate business entities according to their sectors. This is intended to result in a share price increase and three large, focused companies. But the investor reaction has so far been lacklustre. Many must realise the degree of upheaval and restructuring that needs to happen before any synergies can be achieved; Dow and DuPont are extremely ambitious in targeting $3 billion in synergies within 24 months. And in the meantime people will fear for their jobs and productivity will be hit. So in the short term, the only benefactors of this will be the hordes of management consultants brought in to facilitate the restructure. 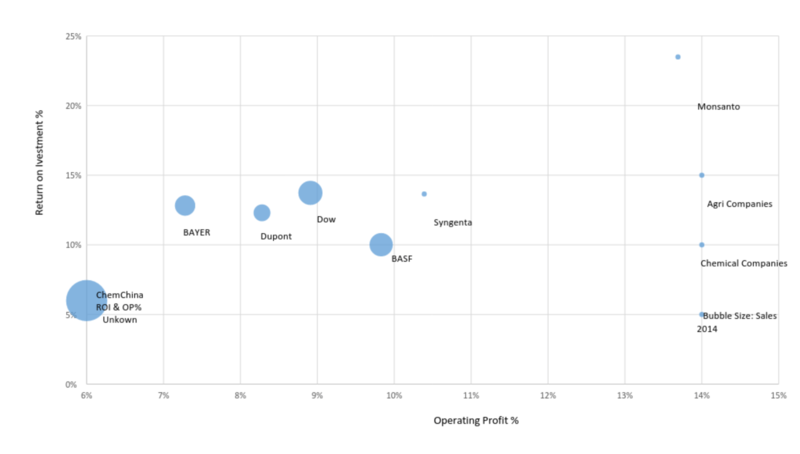 To try to understand the scale and complexity of the businesses that need to be merged purely on the agriculture side — ignoring the material sciences and speciality products businesses — the graphic below shows Dow and DuPont’s seed companies. The dotted lines refer to partial ownership and the full line refer to full ownership. Between the two there is heavy overlapping in row crop seeds — corn and soybean seeds. There is also a very heavy geographic weighting to the US. It seems likely that the next merger or acquisition will be with Syngenta in some shape or form. We know there are at least two active bids on the table. The first is Monsanto, which is understood to be renewing its offer for Syngenta. Of the suitors at Syngenta’s door, Monsanto is perhaps the lessor. A merger with Monsanto would bring enormous disruption to Syngenta’s carefully built empire. Monsanto’s headquarters would move to Basel, most likely to facilitate avoiding some of the US corporate taxes that are heading Monsanto’s way, and this will result in some ruffled feathers for corner offices. not quite sure what this means – why? who’s feathers? Syngenta’s seed division would be carved off and sold to make way for Monsanto seeds. Little of Syngenta as it is known today would survive the restructure, including the management. The company culture of both companies is far apart: Syngenta is a Swiss company, where stiff upper-lipped Brits and ex-McKinsey consultants dominate senior management; while Monsanto is an American company dominated by aggressive MBA graduates eager to prove themselves whatever it takes. So it would not be a marriage made in heaven. Monsanto is keen to access Syngenta’s globally spread sales, which have a stronger international balance (see the graph below). Monsanto lacks a relevant market share in Europe or Asia. Monsanto is also after Syngenta’s crop protection technology which would breathe life into its own product portfolio. The more favourable suitor at Syngenta’s table today is one that many have known was in the background but few could imagine stepping over the threshold of such a large European company. The suitor back with a better offer is China National Chemical Corp (ChemChina), the state-owned chemicals company. 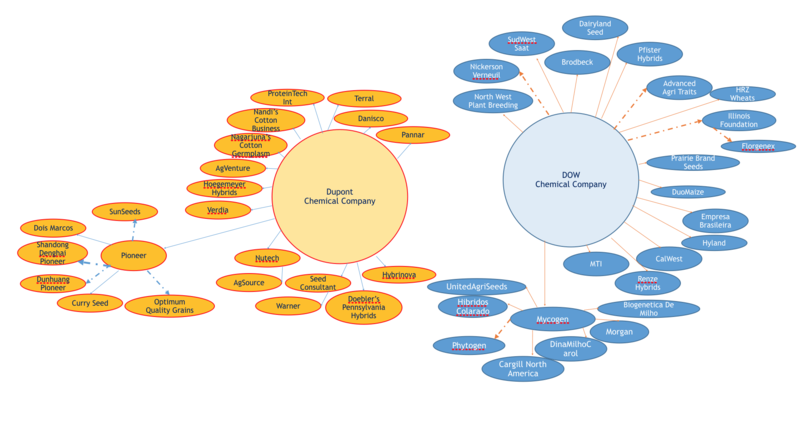 ChemChina is China’s largest pesticide company and its agrochemicals portfolio includes Hubei Sanonda, Cangzhou Dahua, Shandong Dacheng, Jiangsu Anpon, Anhui Petrochemicals, and Huaihe Chemicals. It added Israel-based Makhteshim Agan in 2011, now known as ADAMA Agricultural Solutions to the division in a $2.4 billion acquisition of a 60 percent stake in the company, the largest manufacturer of generic pesticides. It si perhaps difficult to understand why ChemChina, active in so many sectors, is so keen on Syngenta and yet more agrochemicals, especially as they struggle with oversupply in their home market. Apparently ChemChina has been mandated by the Chinese government to go forth and buy-up international agricultural companies, perhaps more to protect and expand China’s control of the world’s food-related industries than anything else. The Chinese are known to plan for very long term and this is no exception. Again Syngenta offers technology and global spread. For Syngenta, Chemchina offers minimum disruption to the company, perhaps a board member or two would join. Otherwise the level of upheaval would be far less than that of Monsanto’s plans. 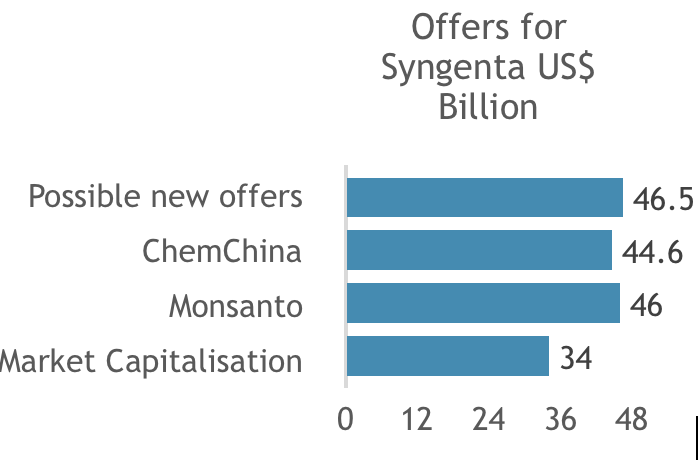 A bidding war could potentially break out for Syngenta between ChemChina and Monsanto. ChemChina offers access to Far East markets but they also bring with them ADAMA Agricultural Solutions. ADAMA sells its products in more than 120 countries, with 2014 revenues of over $3.2 billion. Surely there could be large synergies offered by ADAMA as an off-taker of off-patent products? Ultimately the DowDuPont merger has increased the expectations that someone will acquire Syngenta and soon. ChemChina could bring an easy option with little upheaval and possible synergies of off-patent products as well as offering a stronger route to market to the Far East for Syngenta. A merger with Monsanto, however painful, would produce a crop protection leader with an enviable portfolio. If we review the market’s initial reaction to the DowDupont merger so far it has shown little enthusiasm for major restructuring options. My money is on ChemChina.